If given the choice, who wouldn't eat French fries every night? 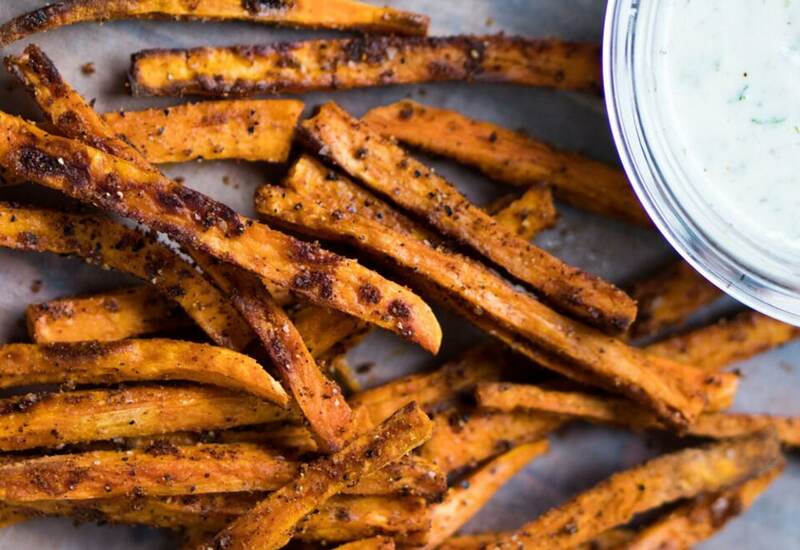 Unfortunately, that wouldn't be the best decision for your health—but luckily, these baked sweet potatoes are the next best thing! They're easy to make and a great source of essential nutrients, so think of these as your not-so-guilty pleasure, perfect for a gluten-free afternoon snack or nutritious side dish. The potatoes are coated in a savory Mediterranean spice mixture and served with a tart yogurt dressing, lightly seasoned with red wine vinegar, parsley and garlic. Trust us, it's about to be your new favorite condiment. The yogurt dressing is very versatile: make a double batch and serve it with roast chicken, on top of spiced lamb or turkey burgers, or with over-easy eggs and toasted pita bread for a savory breakfast. The sauce will keep in the refrigerator for up to five days. Per Serving: 323 calories; 14g fat; 45.1g carbohydrates; 5g protein; 2mg cholesterol; 423mg sodium. What a guilt-free treat! I could snack on these all day. This is one of the only ways I like to eat sweet potatoes and the dressing perfectly compliments the fries. You can probably bake a big batch of these and freeze them for later, but they haven't been able to last long enough for me to do that. I can never get my sweet potatoes fries just right, they always usually turn out soggy. For some reason, this recipe just works. Maybe it's the olive oil. Either way, these are a new favorite.